Can you spot where you'd stop to plop in this "people spot"? I honestly didn't think Andersonville could get any more heavenly. Weren't the big houses, inviting bars and restaurants, giant but friendly dogs, and possibly the country's greatest pizza place (Great Lake) enough? No. The neighborhood also got the city's first "people spot." Wait, it's better than that sounds! Called "parklets" elsewhere—the phrase "people spots" is a Chicago bureaucrat's invention—they're repurposed parking spaces with greenery and a few places to sit down. People seem to be pretty attached to them, if the triumphant reaction from a San Francisco native I know is to be trusted. There are more than 30 in that city, where the idea was born, and they've spread to other cities, like Vancouver and Philadelphia. 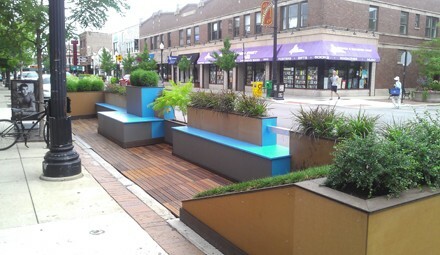 Andersonville got its three-spot-long parklet last Tuesday, on Clark and Farragut. It's the first in the neighborhood, according to Andersonville Chamber of Commerce executive director Ellen Shepard, and residents had wanted one. It was paid for with private donations and funds from the chamber and the local TIF (it's one TIF expenditure we're OK with) Special Service Area, a fund collected and controlled by the community. "All sorts of people are using it in all sorts of different ways," Shepard said on Friday. "It's working beautifully." Another "people spot" opened on Friday in Lincoln Park, and two more are planned for 47th Street. Want more "people places"? You're in luck. The city has a Make Way for People program, aimed at making "People Spots," "People Streets," "People Alleys," and "People Plazas." Plans listed online remain vague in what that will mean, beyond holding block parties. Correction: This story has been amended to correctly reflect that Special Service Area funds helped pay for the parklet. No TIF funds were used.